If you import content from OneNote, Evernote, or EndNote, then document or PDF files may be created in the process. On the Import tab, in the Data group, click Files. Click OK. The Document or PDF Properties dialog box opens. If the entire document or PDF relates to a particular case, you may want to code the entire file at a new case node—click the More button, and then select the Code files at case nodes located under check box. If you have a brief description at the top of the document, when you import the document into NVivo you can choose to use the first paragraph as the document description. When you open a document, it opens in read-only mode. You can code, annotate and link the document when it is in read-only mode. If you need to edit the content of the document, click the blue information bar at the top of Detail View to switch to edit mode. 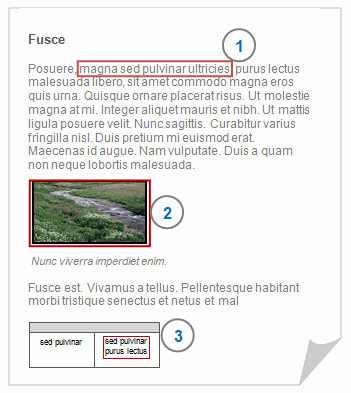 1 Select portions of text—click and drag with the mouse to select the text you want to code, link or annotate. You can also double-click to select a word and triple-click to select a paragraph. 2 Select entire images—you cannot select regions of the image. 2 Select regions of a page. If you switch to region selection, you can click on an image to select it, or click and drag to select a region of the page. When you select a region, you are making an image selection, even if the region you select contains text. 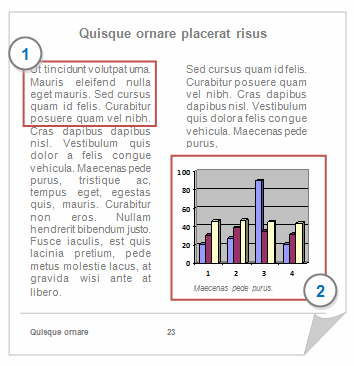 To switch between text and region selection—on the PDF tab, in the PDF Selection group, click Text or Region.